In the Apostolic Johannite Church, today is the Feast Day for Archangel Gabriel whose name translates as "God is my strength" or "Power of God" or "Might of God." This archangel is associated with the element of Water, the cardinal direction of West, the color blue, and the number nine. 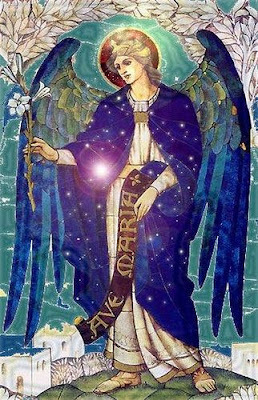 Gabriel is considered the Messenger of God and is the angel who delivers prophecies or explains visions. Gabriel is also considered the Master or Ruler of the Waters. He is said to be the "first adorer of the Divine Word." It is interesting to note that Gabriel is not referred to as an archangel in the Old or New Testaments. It is in the Book of Enoch where this title is bestowed upon him. 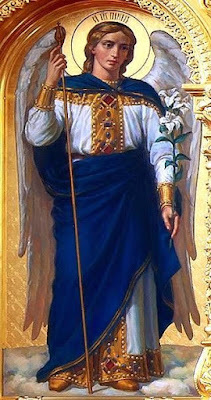 Gabriel is often depicted in blue robes and holding a chalice. Being the Messenger of God, Gabriel is also seen with a horn or trumpet. 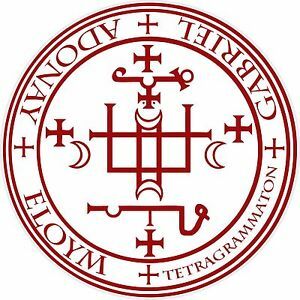 He can also be depicted carrying a lily, a scroll, or a shining lantern. He is most often depicted in artwork of the Annunciation. Being the angel of the waters, Gabriel can also be depicted with the moon.